In 1979, a small network with an unusual name rolled out a big idea: Let viewers make up their own minds. C-SPAN opened the doors to Washington policymaking, providing gavel-to-gavel coverage of the U.S. Congress without editing, commentary or analysis. A lot has changed in 40 years, but that original big idea is more relevant than ever. Underpinning this impartial, balanced coverage is the fact that no government or taxpayer dollars support C-SPAN, as we have always been funded as a public service by your cable or satellite provider. C-SPAN is a public service. We are a non-profit created in 1979 by a then-new industry called cable television, and today we remain true to our founding principles, providing gavel-to-gavel coverage of the workings of the U.S. Congress, both the House and Senate, all without editing, commentary or analysis. Over the years, we've grown to be so much more – on TV, online, on radio, through podcasts and on social platforms (YouTube, Twitter, Facebook and Instagram). We supplement live coverage of the Capitol with ideologically balanced programming concerning all manner of public policy and politics. In so doing, we promote open and transparent dialogue between the public and their elected and appointed officials – and those campaigning for office. Underpinning this impartial, balanced coverage is the fact that no government or taxpayer dollars support C-SPAN, as we continue to be funded as a public service from your cable or satellite provider. C-SPAN began with only four employees: Brian Lamb, Jana Dabrowski Fay, Don Houle and Brian Lockman. 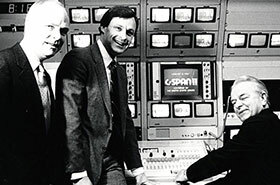 Those four transmitted the first television feed from the U.S. House of Representatives to C-SPAN viewers on March 19, 1979, the first day the House allowed television coverage of its floor debates. 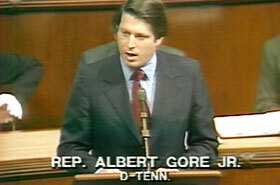 That televised congressional session began with a one-minute speech by then-Congressman Al Gore and reached just 3 million American cable and satellite homes. For C-SPAN founder Brian Lamb and the nascent network's cable system affiliates that provide its funding, the televised House feed was only the beginning. C-SPAN added what became its signature call-in programs the following year to provide a direct conduit between the American public and the nation's political leaders. That direct viewer-to-leader dialogue and discussion of current events continues each day on Washington Journal. In 1982, the network expanded from eight to 16, and then 24 hours, enabling it to add a wider variety of public affairs programming to viewers while maintaining its commitment to carry the proceedings of the U.S. House, live and gavel-to-gavel. In 1986, the U.S. Senate voted to televise its debates, and C-SPAN launched a second channel, C-SPAN2, to provide unfiltered, gavel-to-gavel access to that body. When the House and Senate are in session, C-SPAN commits to covering both bodies live and in their entirety. This is a voluntary commitment; there is no contract with Congress to carry its proceedings. In 2001, C-SPAN3 was launched to provide access to additional public affairs events, particularly live coverage of key congressional hearings. On weekends, ever since 1998, C-SPAN2 becomes Book TV, which covers non-fiction book and author events; and C-SPAN3 becomes American History TV, created in 2011, to offer historical lectures, oral histories and special history series. C-SPAN also extensively covers the president and the executive branch, including regular coverage of the daily White House and Department of State briefings. Coverage of the Supreme Court has been more challenging. Beginning in 1988, with a letter to then-Chief Justice William Rehnquist, C-SPAN has consistently called for the Supreme Court to allow cameras to cover its approximately 75 hours of annual oral arguments. To date, the court has refused this request. The network has televised more than 100 oral arguments before federal courts, which do allow cameras, as well as many state supreme courts. 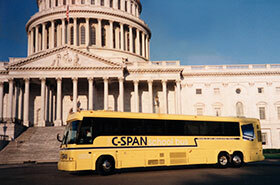 In 1993, C-SPAN created the C-SPAN Bus, a 45-foot interactive learning center to travel across the nation visiting schools and community events in partnership with C-SPAN's cable providers. Bus visitors engage with C-SPAN representatives and interactive tools to learn about our unique public affairs programming and online resources. Most recently, we rolled out the C-SPAN "Cities Tour," which explores the American story through weeklong visits to U.S. communities to record local history and authors. 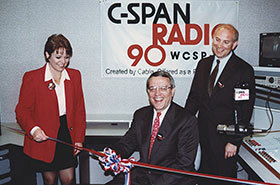 In 1997, we added C-SPAN Radio, available in the Washington, D.C., area and via a mobile app. In 2010, C-SPAN launched the Video Library. All C-SPAN content, since 1987, is archived on our website and is free for public use – now with nearly a quarter million hours of primary source video and growing every day. Our deep multi-platform presence – television, audio, social platforms and our website – makes C-SPAN the go-to resource for political journalists, Capitol Hill staff, members of Congress and the interested public. In the current media marketplace, there's no other place quite like C-SPAN, and perhaps none more trusted. C-SPAN’s highly motivated viewers know they are getting a unique product, one with a special place in the news media. 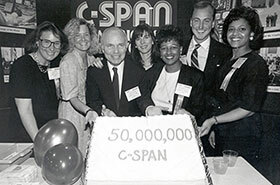 C-SPAN is the recipient of dozens of national awards and citations, including three George Foster Peabody Awards: one for institutional excellence in 1993, one in the historical documentary category for its 1999 American Presidents series, and one in 2011 for the C-SPAN online Video Library. Forty years ago, C-SPAN first put the U.S. House of Representatives on television, opening a window for viewers to get an unfiltered view of government. While Washington may have changed, we haven't. Our unblinking eye on Congress and public debate continues. The window is still open, giving the world a front-row-seat to democracy – allowing you to make up your own mind.